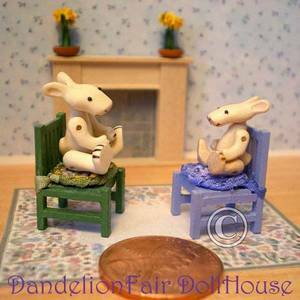 I have always been drawn to miniatures because they invite us to slow down and focus on their tiny magical reality. All of my dolls are carved wood and one inch high (give or take a bit) with some painted features. Each doll takes several days to make. Most are ball jointed at the head/arms/legs and strung together with 0.5mm jewellery elastic which gives them a remarkable range of movement for ones so tiny. I use a multitude of hand tools - knives, bit and files - to fashion every piece of the doll. When finished, each doll gets my artist mark on the inside of its left leg. 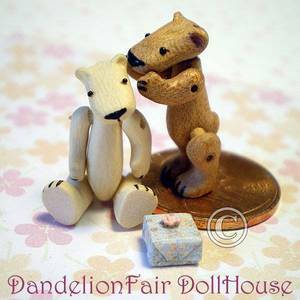 The size of my wood dolls makes them perfect as playscale toys in a regular (1/12th inch) dollhouse setting or as full size characters in a quarter scale (1/48th inch) dollhouse setting. I have made bears, rabbits, dogs, pigs, mice, lions, lambs, tigers, flower fairies and other fantasy animals. While I don't take commissions, if you have a suggestions for a critter I have not made before, let me know and I'll see what I can do! They are soooooooo tiny, I just love them!!! !